With a diamond encrusted crown topped bottle, One Direction’s debut fragrance, Our Moment perfume, is fit for royalty. Inspired by and dedicated to their fans, this English-Irish pop boy band from London worked with fragrance experts to create a playful fruity floral fragrance that is said to be gender mutual! Introduced in 2013, the combination of powdery, fruity, floral scents is just heavenly. Our Moment was a "I'll just spritz it on in the store and see how I feel about it later" trial. Upon leaving the store, I was hit with the true smell of this perfume. I had to stop what I was doing to rush back in the store to purchase this product, which says a lot as I have been wearing the same scent now for ten years and have never found just what I wanted enough to change. Well, this did it for me. I am complimented on it regularly. It definitely works for the twenties-thirties age group. I am still loving it and wearing it daily! 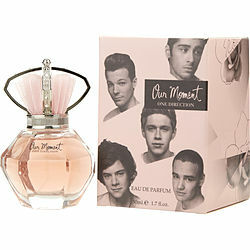 One Direction Our Moment: Such a lovely scent to wear, this is just an overall pleasant scent. I will continue to by this and I hope it is always available! Absolutely LOVE it!!! Is not for me but I love it, is really good for teens and adults, I'm. Goin to buy the new one (between Us) hmmm riquisima I recommend it to! My Daughter loves this scent and so do I. Great for any age.